The heat of summer has caused quite a bit of damage to our plants, trees and lawns. Currently you might notice that many of the leaves have edges that are brown. This is called “Leaf Scorch” and is a condition caused by the hot summer we just experienced. This is not caused by disease or insects, but by the environment. Conditions such as drought, high temperature, winds, and improper watering will allow the plant to suffer. During these conditions, not enough moisture has reached the outer leaves and the exposed leaves have dried out and scorched. 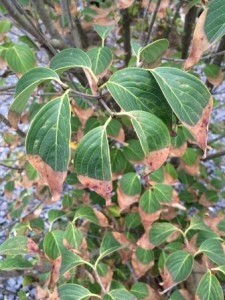 Leaf Scorch is characterized by a yellowing along the edges or veins of the leaf. As the leaves turn brown in those areas, it becomes the most noticeable and, it is at this time that the leaves will not recover. It is most severe on the outer leaves, especially those that face the sun. Once leaf scorch has occurred, there is no cure. The leaves that have already turned brown will not recover, BUT as long as you water properly, the rest of the plant should survive. Deep watering is recommended – a slow, deep soaking of the soil at the roots. During hot weather, watering the roots of each plant for 1-2 minutes in the spring and up to 10 minutes in the summer, every other day, is usually sufficient. When the weather gets cooler, you may water less. This is very important for the plant, especially for the young trees who are still establishing their root systems. Deep watering helps to prevent leaf scorch by making sure the plant will receive enough moisture for even those outer leaves. Unfortunately, over-watering can be just as bad. Test the soil to see how it is. Early morning watering is the best time, before the water will be evaporated by the heat of day. Mulch can also help retain moisture at the roots. Fertilization in Fall will help the plant by giving it back some nutrients it lost during the stress of summer. This is highly recommended for all trees and shrubs that have survived this harsh summer – whether they were damaged by leaf scorch or not. Need an evaluation of your trees and shrubs? Contact us and we will evaluate your property for free.